It is amazing to me how much we depend on our phones. When I got my first cell phone I was so excited that I could make phone calls when I was out without having to hunt down a payphone. I could also take photos which amazed me beyond belief! The pictures were approximately 1" x 1" and I needed a magnifying glass to see them but how cool was is to be able to take pictures when my camera was at home in my closet. Back then it was pretty much a novelty to have a portable phone but now it is essential that I always have my phone with me. Especially when we are on vacation and definitely on our road trips. I was fine with my flip phone for a good number of years. All I needed was to make or receive phone calls when I was away from my landline. I didn't need to text anyone although I was getting texts from friends who didn't know I didn't have the right plan to open them. As a matter of fact, I didn't know how to open them or how to write back. Now I do have the internet and recently had to increase our data plan to 14 GB of data, plus rollover data if any, per month because 6 GB of shared data was not enough for me, Soko and Mike, our youngest. Soko uses his data on games, Mike uses his for streaming music and I need them for the many apps I've accumulated over time. The most important app for me to have with us when we leave the house, which is built into our phones already, is the camera. The camera comes in handy in many different ways other than, most importantly, taking those great shots of vacation sights, food, family and friends. The older we get the more we need our cameras to help us find our car in a parking lot, remember what hotel room we are in, find our meeting place after we come back from venturing on our own. It saves me a lot of time and headache when I take a picture of our parking spot, room number and meeting landmark. 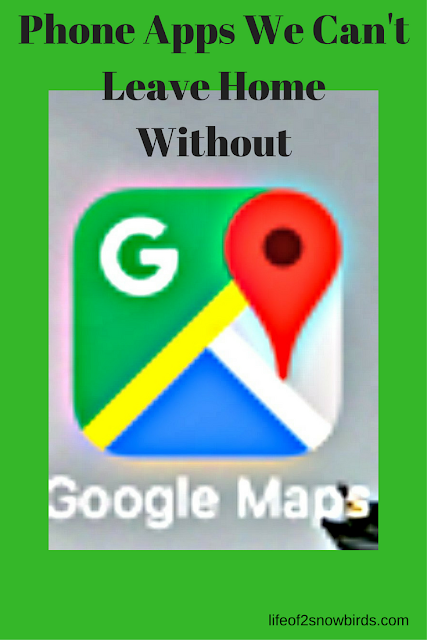 We have a GPS that we depend on for getting us from place to place, but I love the Google Maps app for helping us find the closest Walmart, McDonald's etc., for calculating how much time, either by foot or car, it will take to get from one sight to the next and for checking how long we will be stuck in traffic if we continue on the road we are on. For better monitoring of traffic, we have the Waze app. With our Google Maps I only know that we are in traffic and that we will be in traffic for awhile. With Waze I know the cause of the traffic which can be very helpful in determining whether we should get off the road or not. It's a community-based app which means I get the traffic info from fellow drivers and can also get alternate route advice from them. I can also share any traffic alerts I might know of. We drink a lot of coffee always, but especially when we are on the road. Sometimes I receive coffee gift cards here and there so I love that I can have the Dunkin' Donuts and Starbucks apps on my phone. Now I don't have to remember to take my gift cards with me when I go out. The apps also makes it so easy to pay for our coffee since all I have to do is scan the bar code that displays on my phone. I also love the perks I get for using the apps. We have gotten lots of free coffee since downloading them. I make sure I replenish the money on my Starbucks card when Starbucks has their buy one $10 gift card get $10 for yourself. My daughter, Lisa, lets her readers know when Starbuck's sale is occurring by mentioning it on her website, Drugstore Divas, and I take advantage of that sale every time they have it. I remember occasionally having great difficulty trying to find where I had to go to hail a cab or trying to find the number of a local car service to get a ride when we needed to get somewhere while we were on vacation. Of course the front desk of our hotel could help us with that if that's where we are when we need a ride, but now we have a ride when we need it right at our fingertips. Having the Lyft app takes all the guesswork out of where to find a ride. All we have to do is open the app and request a ride. Depending on how happy we are with the rating and reviews of the driver, we will either accept or reject him/her. On the other hand, once we are in the driver's car, we will make sure we are respectful of him/her and their car as they will be rating us! Paying for our ride is easy as we have our credit card info linked to the app so it gets paid automatically. There's no more fishing around for exact change or waiting for the credit card transaction to go through when we arrive at our destination. A quick goodbye and we are out of the car and on our way. As a thank you for opening the app, Lyft gave me $5.00 off our first few rides so that gave me another reason to be very happy with the app. Lyft is available in about 300 cities so the chances of being able to find a Lyft on vacation is very likely. PayByPhone is a great app that we have that we use to pay for parking at certain meters in some cities. Not every meter is hooked up to this meter payment company but I have used it in Fort Lauderdale, FL and Wilmington, NC. After you get the app and put in your payment info, you can use the app to pay for your meter when you don't have any quarters in your possession. You fill in the meter number and location and pay for the amount of time you think you will need. A handy feature of this app is that it will alert you when you are running out of meter time. You then have the option of adding more time right there on your phone so you won't have to run to the meter. Very often on our road trips, we have to stop for a quick lunch that we will eat in the car because our cat is traveling with us and we don't want to leave her too long by herself. More times than not, we find ourselves at a McDonald's. (We love that there is always an extra entrance/exit door right next to the bathrooms to make a quick pit stop if that is all we stopped there for)! I recently downloaded the McDonald's app and we are thrilled with the money saving deals we get by using it. We have taken advantage of the BOGO sandwich deal a few times already when it's available. Another great deal we are loving right now is, buy any drink get a free McFlurry. Many, or maybe all, McDonald's right now are running a sale on any drink costing only .99 so when Soko gets his large Coke I get a free McFlurry! (Can't wait for this deal to be over with. It is costing me way too much in pounds, and unfortunately I'm not talking about the type of money they use in Europe)! And, last but not least, we are old enough to have an AARP membership. Instead of having to make sure we always have the membership card on us to take advantage of some AARP discounts, we have our card available at all times on their app. Another great feature of the app is that we can use it to browse through a list of places, in the area we are vacationing in, where we can get discounts with our card and they also have a list of events in the area you're in if you're looking for something to do. What are your go to apps when you are away from home? We'd love for you to share them with us! Apps really do rock our worlds these days don't they. I am a huge fan of Google Maps and also the Lonely Planet City Guides app. I hadn't thought of photographing where the car is parked but that is a wonderful idea. Thanks for mentioning the Lonely Planet City Guides. I will definitely add it to my phone. I found this to be so accurate, it's amazing the influence apps have on our lives today! I love hearing about all these apps. I definitely want to check out the WAZE app and the Pay by Phone app. Thanks so much for sharing at Celebrate It! The WAZE app is a new one for us. We had a chance to use it a couple of days ago and chose an alternate route because of what people were posting about the traffic ahead. Thank goodness for both apps. I remember when we had to look at maps and figure everything out on our own. WAZE is a new app for us. We used it on our way here to NY last week and chose an alternate route because of what people were saying about traffic. I did also look at Google Maps so I may be using both!